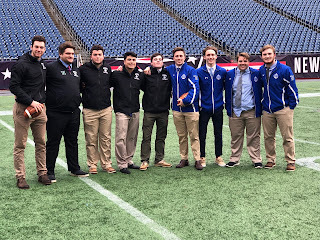 Captains from Nipmuc and Scituate took time on Tuesday morning to enjoy nearly an hour on the field at Gillette Stadium ahead of the Division 5 Super Bowl. On Monday night, we started by looking at the Division 2 Super Bowl between North Andover and King Philip. This morning, we continue by breaking down the Division 5 Super Bowl between Nipmic and Scituate. Check back in later when we dive into the Division 4 Super Bowl featuring Dighton-Rehoboth and Nashoba. Preview: The Division 5 Super Bowl features a pair of teams that are in search of their first state championship in program history. Scituate (11-1) has been on fire from the opening week of the season, suffering just one loss to Duxbury, 35-23. Thriving off a pick-your-poison offense highlighted by senior quarterback Aidan Sullivan and junior back Will Sheskey, the Sailors have scored 151 points over the course of their four playoff games. The Sailors are oozing with athleticism all over the field, with Max Roche, Dan May, and Nate Gould other weapons for Sullivan to choose from. The Sailors have also played well on the defensive side of the ball, particularly over the last three weeks. Sean Tobin leads the fast unit, with Josh McKeever leading the team in tackles, and Gould and Jack Ruble other key contributors. While Scituate's offense has been sky high, it will have its hands full with a Nipmuc defense that has been strong all season. The Warriors have allowed just seven points per game this season, including just a combined 15 points over their last two postseason games. Outside linebacker Jon Hilton, defensive end Nate Gould, lineman Tom Chester, and Joe Schiloski lead the seemingly impenetrable defense. Gould has over 30 tackles go with 4.5 sacks. Offensively, Richard Broni and fellow running backs Preston Dougherty and Schiloski handle most of the load as the Warriors rely on a well balanced offense. Broni has 712 yards and six touchdowns to his name to lead the way. Up front, Chester and Bretton Loftus lead a physical offensive line. Judah Dishington has proven more than capable of stepping up in the clutch when necessary with 958 passing yards and 14 touchdowns on the season. Versatile tight end Matt Richard was injured earlier this season but is back as an option in the passing game and up front. Throughout this postseason, Scituate has lived off its high-tempo offense that stems from the success of both its quarterback in Sullivan and back in Sheskey. When both on their A-game, they become nearly impossible to stop with Sullivan able to extend plays with his legs and Sheskey always a threat to break through defensive fronts with his speed and agility. Nipmuc's defense has been strong all season long, particularly up front, and if they can stop the run and force Scituate to become one dimensional it could open up a path for them to victory. One of the superstars of this year's tournament has been junior Richard Broni. Broni has been instrumental in the Warriors postseason success flourishing out of the backfield and also forcing a couple of turnovers on defense. Helping Broni wrack up yardage has been a strong offensive line, and if Nipmuc hopes to consistently move the ball on the Sailors they will have to win the battle up front. An ability to turn the game into a slugfest, highlighted by Broni's prowess out of the backfield and generated by a big push from the line, is a key for the Warriors. 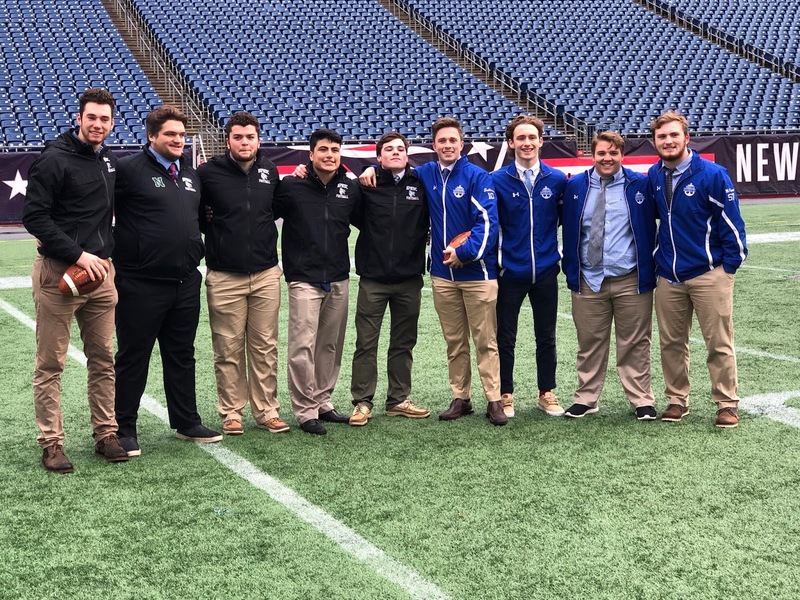 In its state semifinal showdown against Swampscott, Scituate was able to take Big Blue out of its element before it felt like the game even started. Within the blink of an eye the Sailors had 28 points, and held a 163-12 advantage in yardage. Its unlikely the 10 minute quarters will deter this Sailors offense all that much. As a result, it will be critical for Nipmuc to force Scituate into third down and longs, generate a of turnover or two, and win the field possession battle so to prevent Sullivan and company from getting into a consistent rhythm.